Topped out of Machete Direct to a beautiful view an hour before sunset. 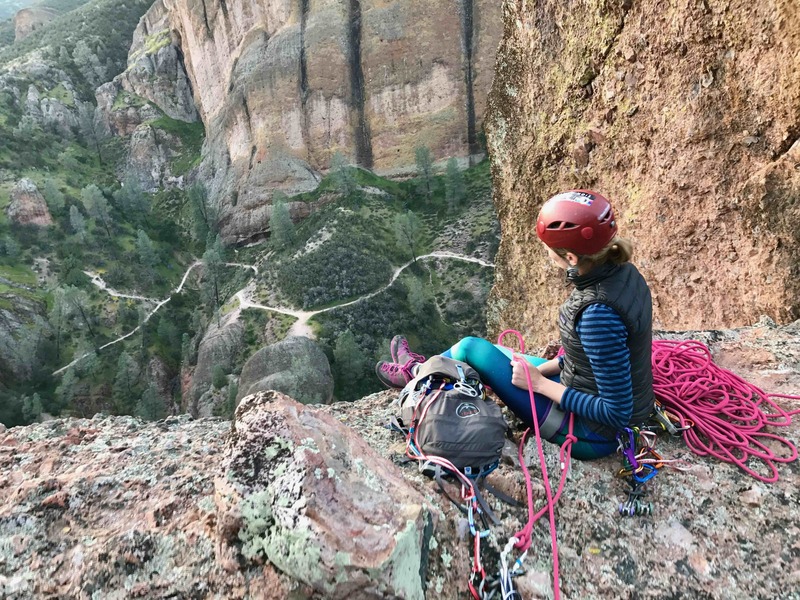 This last weekend I finished my first multi-pitch aid climb: Machete Direct (5.10a A1 R, 6P) in Pinnacles National Park. It was a real adventure with runnouts to make my fingers sweet, unexpectedly technical sections and a night decent following a paper thin route description. Hiking into pinnacles from the West side you see two impressive continuous chunks of rock. 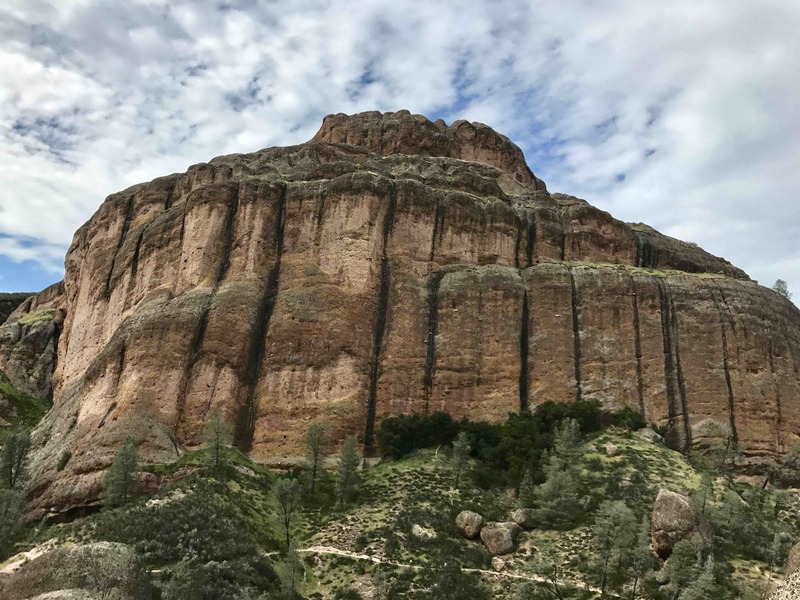 The North feature is ‘the balconies’ which were closed for climbing due to Perguiin Falcon nesting (use ‘sensitive areas’ link) and the South was Machete ridge which hosted a handful of aid climbs up its 700 ft face. Our climb would start in an empty streambed just before a metal gate entering ‘the caves’. 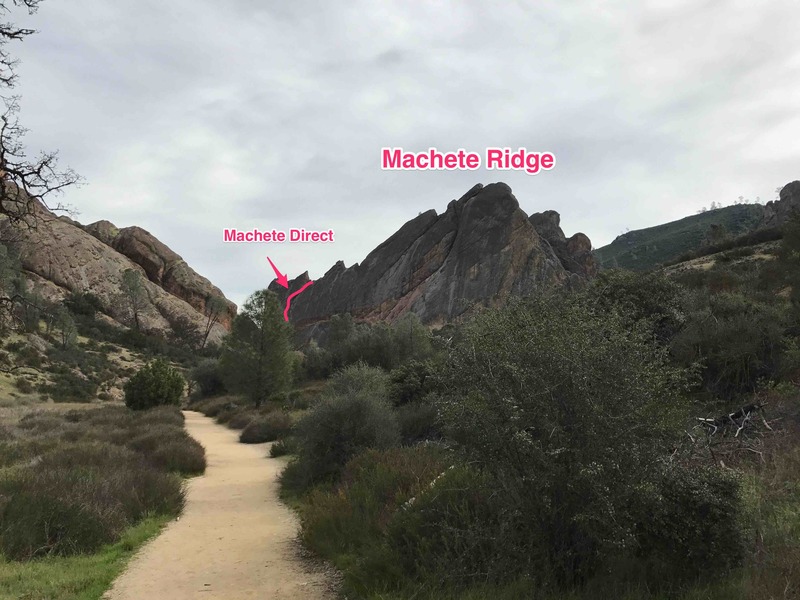 View of Machete from the approach trail. Pinnacles has this volcanic rock that looks like cement. A heterogeneous composite that looks like molten putty dragged through a scree field with its jutting pebbles and fist sized handholds. The wall looked was if there were handholds everywhere, holds that could pull out at any moment. However, for most of the climb, these rock protrusions would remain solid and trustworthy no matter how they felt. The lichen that engulfed the face of the entire limb however was not and I would constantly have to brush it off to gain friction on a foothold. There were two approaches to the start. 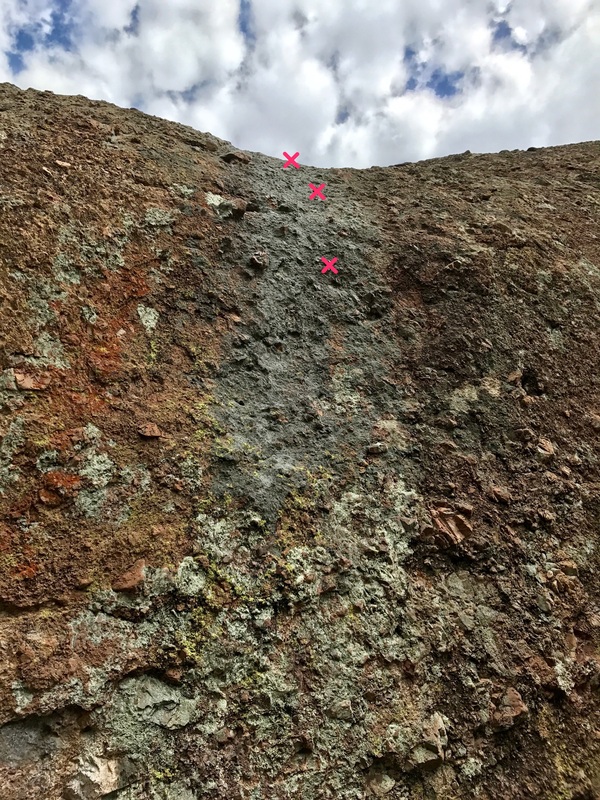 The original 5.10a/b runout climb going straight up and an alternative diagonal 5.8 that involves utilizing a tree 15 feet to the right. The choice was simple. I was here to do Machete Direct, how could I choose an alternative start? So I start leading this first pitch on rock like I’ve never climbed before that looked sketchy but mostly held. The start was run out and I worried about hitting the deck as I gained the 12 feet of stressful climbing to the safety of my first bolt. Two more bolts brought me to the first aid section. Instead of the straightforward walking up a ladder I had expected. The bolt ladder brought me over a slightly overhanging bulge in the rock. I didn’t remember the tips for climbing overhanging aid so I mostly struggled on lead to hold myself against the wall with one arm while leaning backwards and grasping for the next bolt to clip my aid ladder into. It was exhausting and I was happy to reach the anchors. 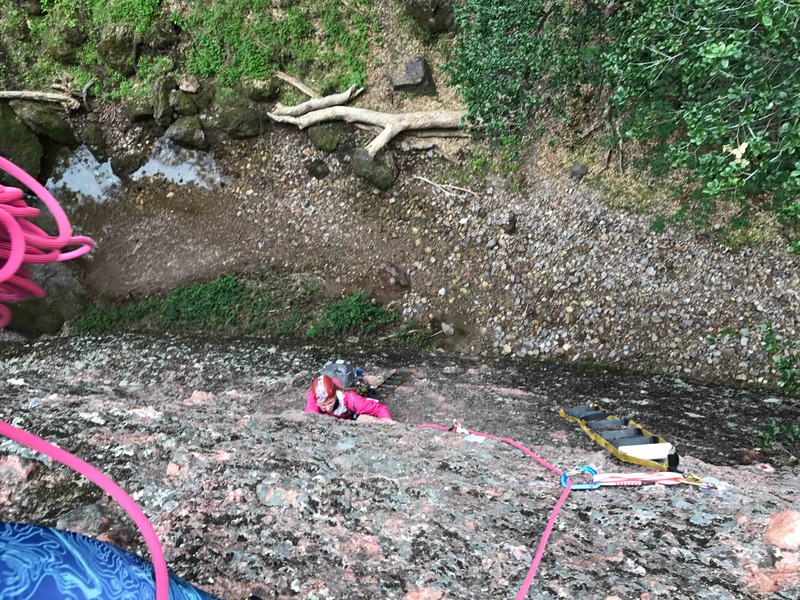 Beforehand I had considered the aid sections small and likely straightforward so I suggested Sadie leave her ascenders at home and instead re-aid the pitches on second. Lucky for her! Now she could have the same unenjoyable experience. 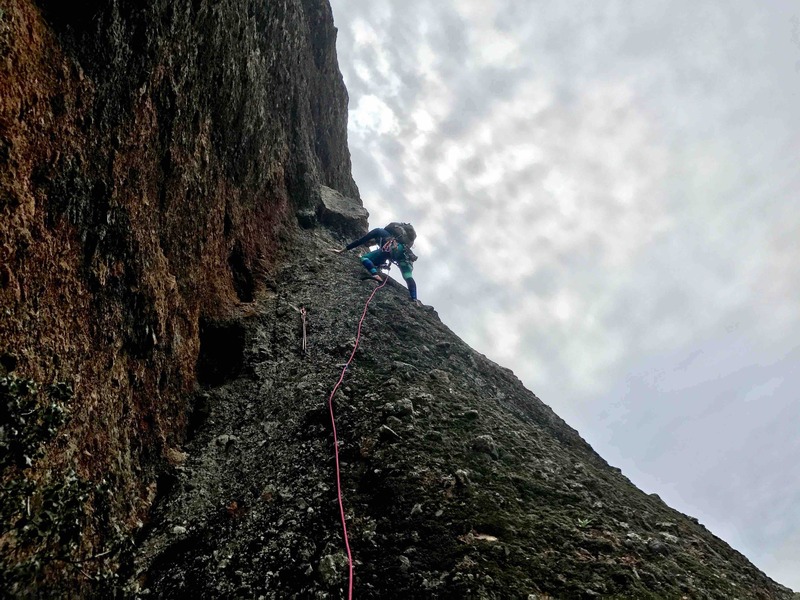 The second pitch was the segment that gave this climb its (R) runout rating. On Snake Dike the (R) didn’t really bother me because it was clear where the holds were and the granite was solid. However, on this pitch every extruding pebble looked like it might fall out and even good solid holds had slip potential due to the lichen. My hands were sweating as I envisioned scraping my body across this course sandpaper surface on a lead fall. Again elated to reach anchor, I felt exhausted from the last two stressful pitches. Luckily Sadie was going to lead our next PG13 traverse. It was super fun. Sadie leading the pitch 3 traverse. The first two pitches had taken some time given the circumstances, leaving us both hungry on the favorable ledge atop P3. 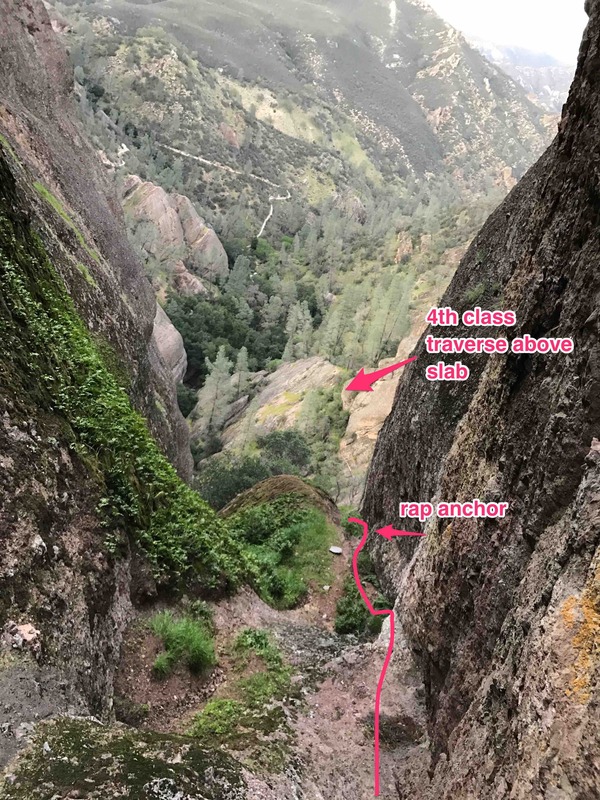 This was the first multi-pitch climb EVER that we were the only people on the route. No line behind us pressuring us to keep pace. Without this pressure I was able to eat lunch with Sadie overlooking a green and brown rock landscape relaxed and completely be in the moment. It was wonderful. After lunch it was my turn again to lead the next two pitches. The first one had a strange transition where you had to aid the first bolt and then free a move to aid the next bolt. It was impossible to back clean my first aider after the free move given how far away I was so I left it for Sadie to clean. 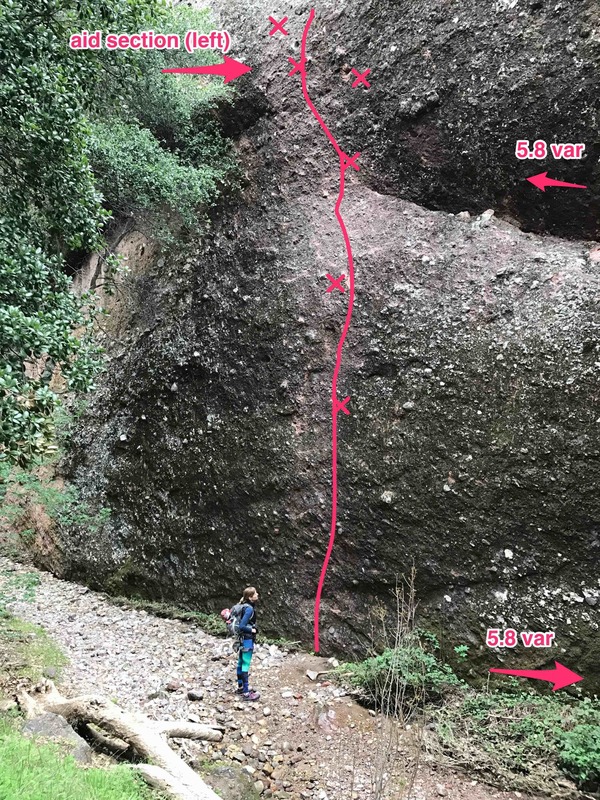 The next pitch (P5) involved moving up a true bulging overhang. Too strenuous to just muscle through, I improved clipping my daisy into the bolt so I could step higher and wouldn’t have to physically hold myself up the whole time. This is sort of like what you are supposed to do leading aid on overhanging terrain. Once on the upper part of the bulge, aiding was easy and it is straight forward ascending the gulley to the next belay. Which sucked. 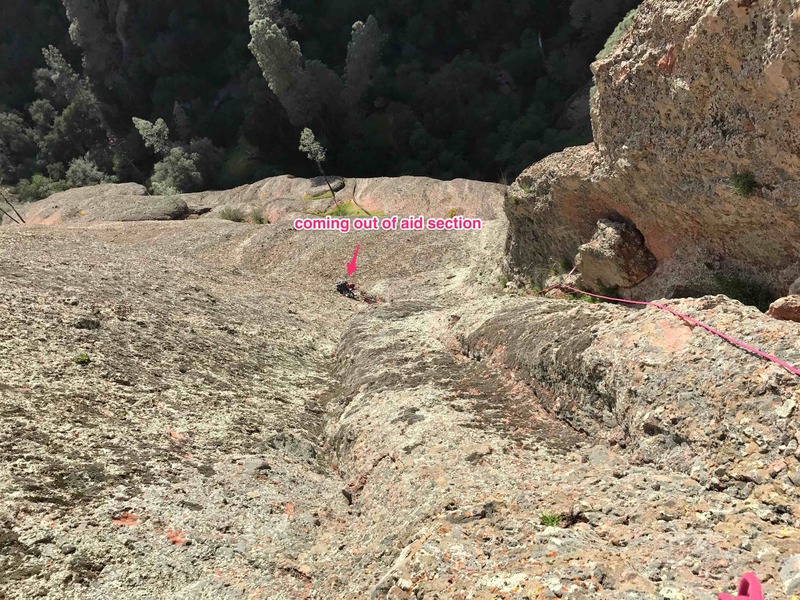 The feet at belay were poor, one of the bolts was a rusted pin and it was right underneath the rock chute which funneled loose rock from the next chossy corner pitch. Why didn’t they bolt the belay to the right in a pocket with better feet and protection from falling rock? I don’t know. After a hard follow on P5, Sadie quickly lead P6 and we were on the top treated to an amazing view of the balconies. Sadie following on pitch 5, coming out of the aid section. The day had gotten long with lots of lessons so we skipped the optional last pitch to the top of middle tower with nascent route information. The descent started straight forward. Its one rap off the backside into a gulley and then 3-4 more rap anchors all bolted on the right side down the gulley. (Stay right this whole time and don’t be convinced to go off any of the steep sections to the left.) These anchors down the gully felt a little unnecessary since its mostly a 2nd class trail. Once the gulley opened up we ran out of rap anchors…and mountain project beta. In front of us the gulley dropped over a cliff. To the right was a tenuous traverse. So, as the light faded we set up an anchor on a tree and I tension traversed underneath the cliff. Unable to find any anchors I decided to stay roped up and traverse right (descent right) above the 4th class slab. There was no trail until I got about 100 ft across and I saw a worn dirt path winding going down through some trees. Success! It may be dark but we were back on track! We followed a dirt path by headlamp until the terrain became bouldery and the trail disappeared again. There were massive boulders resting upon each other in front of us. Looking through their gaps I could see 50-100 drops to the ground. It was possible to go right on more dirt and brush, but it remained the same altitude with a 70 ft drop off next it. We did some scouting around until I saw some light reflecting off to our left. I explored towards it and spotted what I thought was a piece of metal railing in an upside-down ‘u’ (hoping it wasn’t a branch shadow). To reach it I down climbed a section that would be hard to re-ascend, but I was right! Following several metal rail sections we finally touched down in the ‘the caves’ and walked out the way we came in. The park was closed but the gate wasn’t locked. The whole climb had a lot of lessons and was a huge adventure. I’m not a fan of Pinnacles rock, but its not as chossy as I had heard. Definitely recommend the route (after I update the mountain project descent).